Remove R9, C2, and R5 on the Tiny Trak II (TT2). Use caution as the traces on the TT2 are very thin. 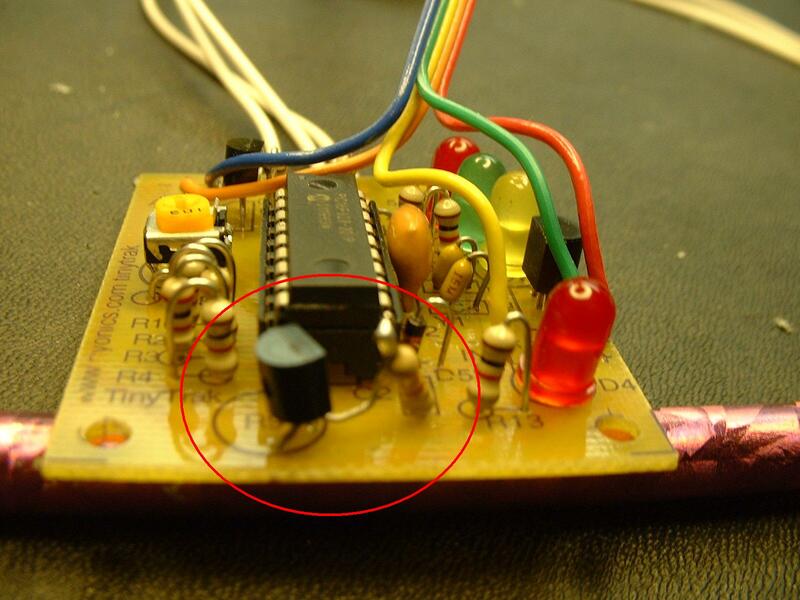 Install a jumper in R5 using a piece of resistor lead. See Photo 3, green circle. 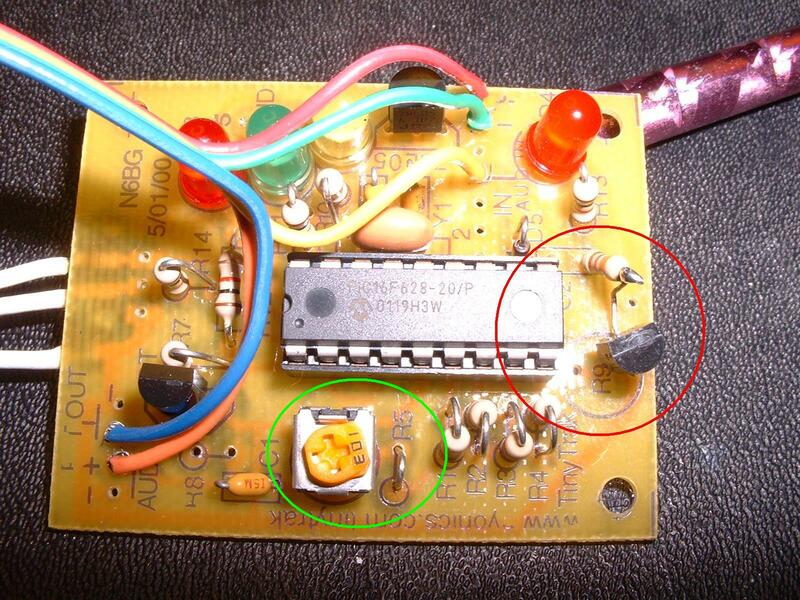 Install one lead of a 3.3KOhm 1/4-watt (orange/orange/red) resistor into the AUDIO IN side of the C2 part location. Emitter to the GROUND connection of R9. Collector to the TAP connection of R9 going to IC1 Pin 10. Base to TOP of the 3.3K resistor mounted in STEP 3. Note: IC1-10 is internally pulled up to +5V so there is no need for an additional collector resistor. See Photo 3, red circle. Remove the DE9S connector and re-install pin for pin using 12" lead wires. Pin 2 - Serial data FROM TT2. Pin 3 - Serial data TO TT2. Note: This is a great opportunity to change to a DE9P Male connector and swap Pins 2 and 3. This allows a direct connection to a GPS. 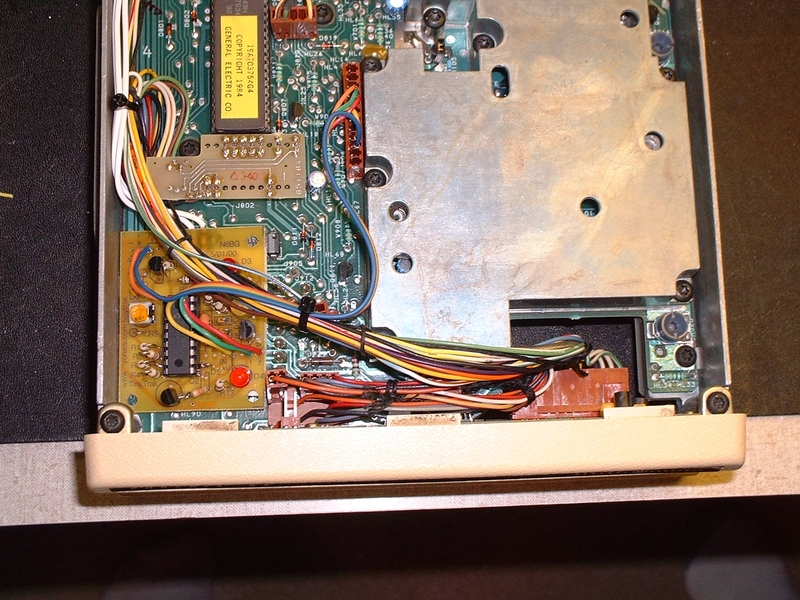 Connect the TT2 to the 12-pin single-row header localed on the TOP board of the Phoenix SX. Place the board in the Phoenix and affix with double-sided foam tape. Rotate R6 on the TT2 fully counterclockwise. WARNING! 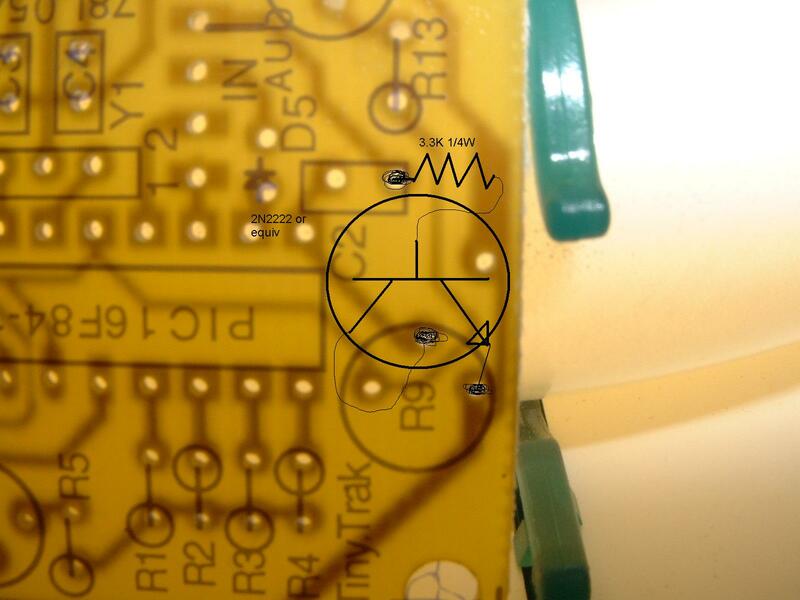 Before applying power to the radio, connect to a suitable antenna or dummy load. D3 (Red) should light solid. D1 (Yellow) and D2 (Green) will blink for about 1 second. Note: Transmitter is keyed when D4 is lit. Test the COR sense by rotating the Phoenix squelch pot counterclockwise until the BUSY light on the front of the radio lights. D1 should light. The squelch pot is located on the bottom board of the Phoenix adjacent to the corner of the RF shield closest to the front of the radio. Rotate the squelch pot until BUSY goes out. D1 should blink then go out. Program the TT2 using the TT2config.exe software from Byonics (http://www.byonics.com). To set the output deviation, use TT2config.exe's SEND TONE function and set the transmit deviation to about 3.5KHz using your service monitor by adjusting the MOD pot located on the top board in the far front-right corner.